Recently Played, a feature available for Radio Mobile Apps & Websites is available as an Addon in all mobile plans and a built-in component for radio websites. You can purchase this Addon for mobile plans by logging in to your account and clicking Get Addons. 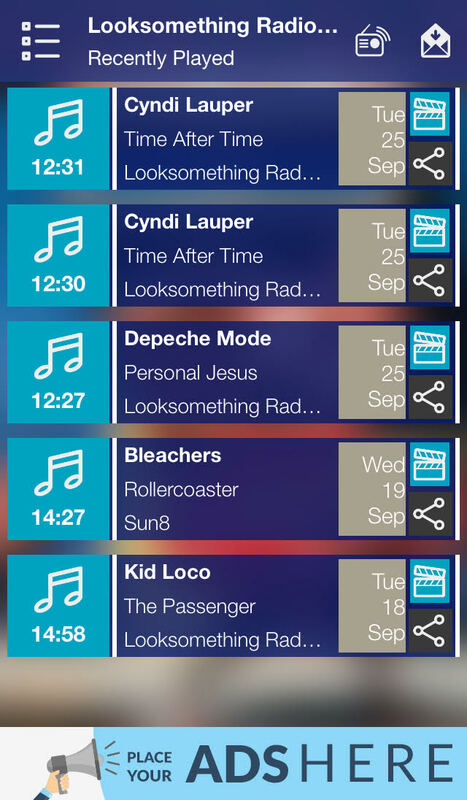 Recently played allows your listeners to view the latest songs they have listened to. Title, artist & a link directing users to YouTube’s search results for each song will also be displayed. You can easily activate or deactivate Youtube search results by visiting Settings in your Admin Control Panel. In case Social Share Addon is activated your listeners may also share each track on several social networks, messengers & apps (Facebook, Τwitter, Skype, Viber etc.) or via email. Please note that Recently Played works only if your streaming is transmitting the required metadata; song title & artist name. In case your streaming does not transmit metadata you will need to contact your streaming provider.